This document is a technical summary of the unpublished Federal Highway Administration report, Analysis of an Ultra-High Performance Concrete Two-Way Ribbed Bridge Deck Slab, available only through the National Technical Information Service, www.ntis.gov. This TechBrief highlights the design process for an ultra-high performance concrete (UHPC) two-way ribbed prestressed bridge deck element. UHPC is a relatively new material which has demonstrated good durability properties, high compressive strength, and usable tensile resistance. (1,2) The desirable high compressive and usable tensile resistance can lead to smaller and more efficient precast cross sections. The durability properties of UHPC specifically lend themselves toward use in the most highly environmentally stressed portions of the bridges in our nation’s inventory, namely the decks. The 2006 American Association of State Highway and Transportation Officials (AASHTO) Load and Resistance Factor Design (LRFD) Bridge Design Specifications serve as guidance for design loads on the deck system while UHPC material characterization and structural behavior studies aid with the moment capacity analysis of the deck element. 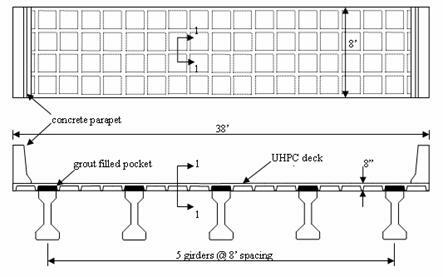 The design process described in Analysis of an Ultra-High Performance Concrete Two-Way Ribbed Bridge Deck Slab is a step toward the development of design specifications for UHPC. Table 1. UHPC Material Properties. Figure 1. Prestressed UHPC Beam Internal Stress Distribution. A rectangular prestressed UHPC beam (figure 1a) loaded to ultimate capacity develops an approximate internal stress distribution (figure 1b) similar to the previously described uniaxial stress-strain behavior. For simplicity, an idealized, simplified stress distribution (figure 1c) is used for analysis. Variable definitions for figure 1 can be found in the accompanying technical report. Internal forces are then resolved from the simplified stress distribution and used to determine the capacity of the UHPC member. Design of the UHPC two-way ribbed deck first consists of defining an element and then determining the live, dead, and collision design loads on the UHPC deck for different limit states. The design followed the 2006 AASHTO LRFD Bridge Design Specifications where appropriate. 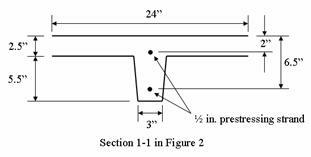 Figures 2 and 3 illustrate the proposed deck panel and beam cross section for analysis in the accompanying technical report. The analyzed UHPC deck panel is 11.6 m (38 ft) wide and 2.4 m (8 ft) in the direction of traffic. Two 12.7-mm- (½-inch) diameter prestressing strands in each transverse rib provide flexural resistance and ensure that flexural cracks remain tightly closed. A concrete parapet spans across longitudinal post-tensioned deck elements. Composite action between the girders and the deck is assured via shear connectors that extend from the girders into pockets created between webs of the deck panel. These pockets are filled with grout. Figure 2. UHPC Bridge Deck Panel Plan and Cross Section View. Figure 3. UHPC Beam Cross Section. The positive and negative moment capacity for the proposed cross section is determined from the experimentally observed behavior of UHPC in bending, stress-strain compatibility, and basic principles of mechanics. The moment capacity analysis was completed through an iterative process. Generally the neutral axis depth is assumed and a stress-strain analysis is performed on the cross section. Internal forces are resolved from the stress-strain analysis and equilibrium of the cross section is verified. The analysis of the UHPC cross section shown in figure 3 reveals the positive and negative bending moment capacities to be 49.2 kN-m (36.3 kip-ft) and 64.5kN-m (47.6 kip-ft), respectively. These capacities exceed design loads for both positive and negative bending within different regions of the bridge deck. When compared to traditional cast-in-place reinforced concrete deck designs, the proposed UHPC deck design has a 20 percent higher positive moment capacity. In negative bending, the UHPC deck has a slightly higher capacity when compared to traditional designs provided the collision capacities of the railings are similar. The design example and analytical process detailed in the accompanying technical report illustrates that a UHPC deck panel is capable of resisting vehicular and collision design loads. However, experimental studies on full-scale UHPC decks should be conducted to verify the applicability of all design assumptions and the proposed UHPC flexural methodology. With additional data, a more confident design process for UHPC can be further established and thus lead to established design specifications. Graybeal, B.A. “Material Property Characterization of Ultra-High Performance Concrete.” Report No. FHWA-HRT-06-103. August 2006. McLean, VA: Federal Highway Administration. Graybeal, B.A. 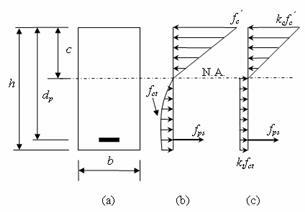 “Structural Behavior of Ultra-High Performance Concrete Prestressed I-Girders.” Report No. FHWA-HRT-06-115. August 2006. McLean, VA: Federal Highway Administration. Researchers—This study was completed by Hector Garcia of the FHWA Resource Center and Ben Graybeal of the FHWA Turner-Fairbank Highway Research Center. Distribution—The unpublished report covered in this TechBrief is being distributed through the National Technical Information Service (www.ntis.gov), NTIS Accession No. PB2007-112112. Availability—The report will be available in late 2007 and may be obtained from the National Technical Information Service (www.ntis.gov). Key Words—Ultra-high performance concrete (UHPC), fiber-reinforced concrete, bridges, bride deck, precast concrete, prestressed concrete, design methodology. Quality Assurance Statement—The Federal Highway Administration provides high-quality information to serve the Government, industry, and public in a manner that promotes public understanding. Standards and policies are used to ensure and maximize the quality, objectivity, utility, and integrity of its information. FHWA periodically reviews quality issues and adjusts its programs and processes to ensure continuous quality improvement.